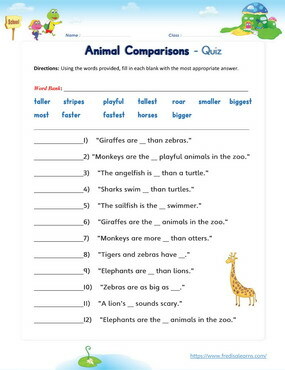 Teach English lesson how to compare animals using comparatives and superlatives. The lesson also teaches English learners other ways of describing animals using essential vocabulary. 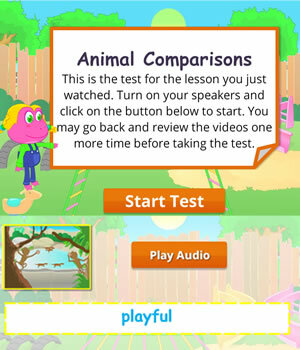 The skills learned in this lesson will enable EFL/ESL young learners to be able to compare and contrast people, objects, animals and more. 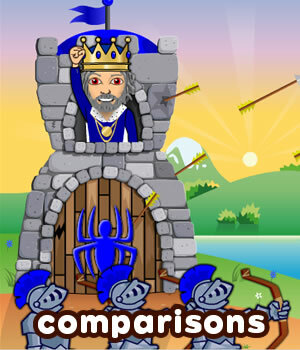 Learning comparisons in English is an essential communication skill every learner needs. The worksheets below are useful for offline and classroom activities. 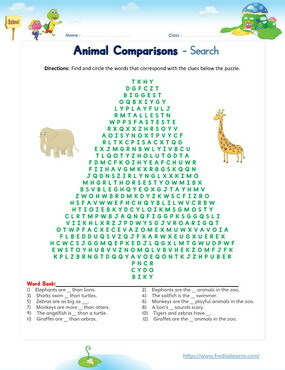 These printable exercises directly correlate with the above lesson 'Animal Comparisons'. Every worksheet comes with an answer sheet on the second page for educators. Mom, Dad, Freddie and Lisa are visiting the zoo. They are delighted to see swimming turtles and otters. This leads to a conversation on the differences between the animals in the zoo. Elephants are the biggest animals in the zoo. The angelfish is smaller than a turtle. The angelfish is the smallest animal in the zoo. Giraffes are taller than zebras. Giraffes are the tallest animals in the zoo. Otters swim faster than turtles. Turtles swim slower than otters. The sailfish is the fastest swimmer in the world. Monkeys are more playful than otters. Monkeys are the most playful animals in the zoo. Zebras are as big as horses. The angelfish is as big as my thumb. Horses do not have stripes but zebras do. A lion's roar sounds scary. Lisa: Let’s go see the turtles! Freddie: Oh, I love the turtles. Let’s go see the turtles. Freddie: Look, Lisa, the turtles are swimming! Lisa: It must be wonderful to swim all day. Freddie: If I was an animal, I would want to swim. 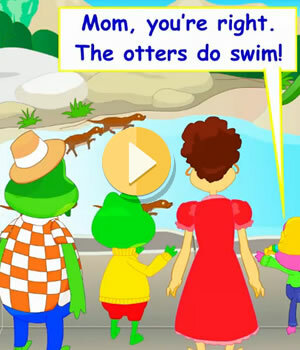 Mom: The otters are swimming animals too. Lisa: Can we go see the otters, Mom? Mom: Yes, let’s go see the otters. Lisa: Mom, you’re right. The otters do swim! Freddie: They are faster swimmers than the turtles. Lisa: They really like to play! They are more playful than the turtles, too. Dad: Yes, otters are very playful animals. Lisa: Freddie, look! They are playing chase! Freddie: They are so cute. Lisa: They are my favorite animals. Freddie: Can lions swim, Mom? Mom: I think they can, but they mostly live on land. Lisa: They are very big animals. Freddie: They are much bigger than turtles. Lisa: I don’t like the lions. They scare me. Freddie: We should go see the zebras. They will not roar and scare Lisa. Freddie: Zebras are a lot like horses. Lisa: They are. They have stripes and horses don’t. Mom: You are right. Horses don’t have stripes, and zebras do. Freddie: They are very big animals too. Lisa: Freddie, I do not think they are as big as elephants. Do you? Freddie: Let’s go see the elephants and find out, Lisa. Freddie: Woah, the elephants are very big! Lisa: They are bigger than the zebras. Mom: Do you think they are the biggest animals in the zoo? Lisa: I wonder what the smallest animal at the zoo is. Dad: The smallest animal at the zoo is the angelfish. It is only as big as your thumb, Lisa. Freddie: Wow! Imagine that angelfish right next to the elephant.